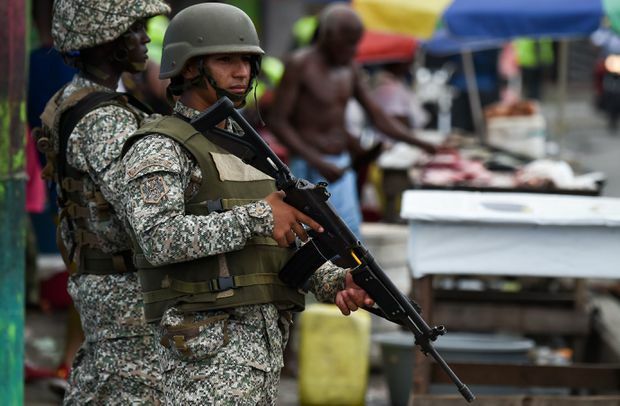 Colombian marines stand guard in the streets of Tumaco, a municipality in the Colombian department of Narino near the border with Ecuador, on April 16, 2018, days after military presence has been reinforced following the murder of an Ecuadorean journalist team in the area. Ecuador and Colombia are preparing a joint manhunt and military operation in the border region where two journalists and their driver were killed by a dissident faction of Colombian rebels last week. Ecuadoreans angry at their government for its failure to do more to save the team from national newspaper El Comercio say this is a long-overdue response in a region that has become a narco-trafficking corridor after decades of state neglect. The deaths shocked Ecuador and led to sharp criticism of the government of President Lenin Moreno for its handling of the abduction. The killings also made clear that although Colombia signed a peace deal with the Revolutionary Armed Forces of Colombia, known as the FARC, in 2016, rebel activity in the country retains the potential to destabilize the region. “The kidnapping and murder of the El Comercio press workers shows how the complex violence in Colombia is far from over,” said Andrea Castro, a security expert in Quito. On April 17, tensions rose further when Ecuador Interior Minister César Navas said the same rebel group had kidnapped another man and woman, believed to be Ecuadoran nationals, in the same region. In a video sent by Whatsapp to Colombian authorities, the detainees are shown saying they would be released in exchange for nine imprisoned rebel fighters. The Ecuadorean government said it would not negotiate and set a 10-day deadline for the rebel leader to surrender. Ecuador has sent 550 police officers to the town of Mataje, in the area where the abductions have occurred, and the government said it would target the dissident rebels in a military operation. Ms. Castro said that it will be the first real joint engagement in border security, but must be well-planned and continuing, rather than just political window-dressing, given the multiple actors fighting for control of the coca-growing regions of southern Colombia and the transit routes around the border. The El Comercio reporting team (reporter Javier Ortega, photographer Paul Rivas and driver Efrain Segarra) was investigating drug-related violence in the border region when they were abducted on March 26. A rebel group known as the Oliver Sinisterra Front released a “proof-of-life” video a few days later in which the men, shown chained together in the jungle, addressed Mr. Moreno and said he must secure the release of three rebels who were jailed in Ecuador on charges of smuggling, and meet other demands, to save them. On April 11, the Front said in a statement that it killed the men because the two governments were carrying out military operations near its base – something both governments deny. Two days later, Mr. Moreno confirmed the Ecuadoreans were dead. The killings did not follow the usual pattern for hostage-takings in the Colombian conflict – which typically involved lengthy negotiations – and there is speculation that the rebels were mainly seeking to raise their profile as influential actors in the conflict zone. Top Colombian officials, including the Minister of Defence, immediately flew to Quito for meetings about a co-ordinated response. The International Committee of the Red Cross is attempting to co-ordinate recovery of the men’s bodies; the military offensive appears to be on hold until that is concluded. The Sinisterra Front is led by Walter (Guacho) Artizala, who was a mid-rank FARC commander and operated on both sides of the border; he is now believed to have about 80 troops under his leadership. He has no relationship with the leaders of the FARC who signed the peace accord, Ms. Castro noted. “It shows how violence is mutating in the region,” she said. The great majority of the FARC’s 7,000 fighters demobilized after the signing of the peace deal, handing in their weapons and transitioning to civilian life. As part of the agreement, the FARC promised to end its involvement in narco-trafficking, with which it once funded its guerrilla war. However, some of the small number of rebels who rejected the peace deal have formed alliances with coca-exporting organizations including Mexican cartels who have moved to occupy the vacuum created by the FARC pullback. In their last article published before the kidnapping, the El Comercio team wrote about the presence of FARC dissidents in Ecuador’s Pacific coast border with Colombia. The region has drawn little scrutiny from successive Ecuadorean governments, despite the fact that residents routinely reported FARC and then later dissident rebel activity, and that it is a well-known route for narco-trafficking. The densely forested border region has many wide rivers that lead to the coast, where drug shipments can be loaded on to speedboats for transport north to Mexico and North America. The journalists were investigating two recent bombings, highly unusual events in an otherwise peaceful country. In late January, a car bomb behind a police station wounded 28 people in San Lorenzo, a town near the border; two months later a roadside bomb near the town killed three people and wounded 11. Ecuadorean authorities say Mr. Artizala ordered both attacks. However, the journalist killings are seen as a sharp escalation of the conflict, one that will require a significant response from Quito. Protesters gathered outside the presidential palace the day after the deaths were confirmed, chanting “You did nothing!” and major news outlets staged blackouts as a sign of mourning for their colleagues.